Farm To Fork, Valentine’s, Wine Dinners & Our Expansion! We hope you are recovered from the Holidays and ready to take on the New Year! At the restaurant we hosted a wonderful New Year’s Dinner to close out 2017 before taking a short winter break. The time off always allows us to look back at the previous year and gather inspiration moving into another year of business. We spent four days in Mexico, and our staff enjoyed the time off as well visiting places like San Francisco, Portugal, Napa, New York & Houston. 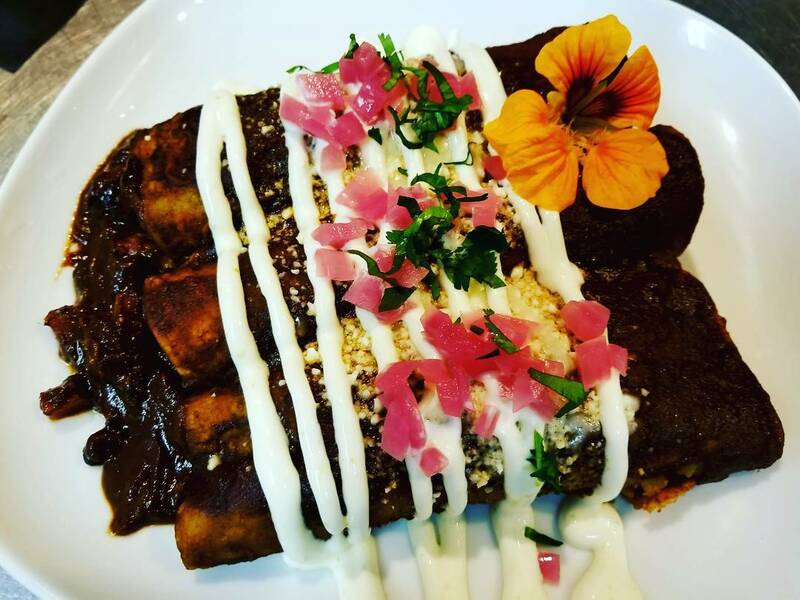 The photo you see here is a vegetarian enmolada entree we served up our first week back, a direct testament to some inspiration gained while dining at one of our favorite restaurants in Mexico. We love our Latin influenced dishes and you can expect to see other new items show up on the menu in the coming weeks. All next week, Tuesday Jan 16 – Saturday Jan 20, we will be participating in Farm To Fork week. Farm to Fork is a chance to support local chefs and restaurants that have made a commitment to support local farms and purveyors. For our part, we will be offering a $40 three course, prix fixe Farm to Table dinner option, in addition to our a la carte menu. This year Valentine’s Day falls on a Wednesday, so we will be celebrating on both Tuesday, February 13th and Wednesday February 14th. We’ll have the tables beautifully set with tablecloths, candles and flowers. On the menu expect to see Beef Tenderloin, Frenched Pork Chops, Vegan/ Vegetarian Risotto and Fresh Catch Seafood, along with some decadent desserts. We will be busy, so reservations are recommended. You probably have heard by now that we are expanding! Our location will remain the same, but coming this Spring look forward to our wine lounge with additional patio seating and upscale casual indoor seating, as well as an expanded wine menu and more small bites. We are also happy to share that we have added more patio cover and are now just about 100% rainproof, and therefore considerably warmer! The entire side patio is now covered, as is the new back patio that we will be expanding to. There is still a lot of work ahead, but this is a huge milestone for us as well as the entire Rolando community, and we are incredibly excited to bring you Garden Kitchen 2.0.